In North Dakota there are no professional sports teams. This is a land of vast prairie where winter rules for half a year, every year. It is not a place for wimps or for complainers; it is a place for self-sufficient sorts. The nation’s third least populated state, with fewer than 700,000 souls, North Dakota has a $1 billion budget surplus, and an unemployment rate that dances around 3%. Like people everywhere that work, income follows. North Dakota is ranks 17th in United States in income per capita. Whether they come from energy-rich Williston, Minot, Bismark, or Fargo, North Dakotans are proud of their state. In Grand Forks, on the campus of North Dakota University stands perhaps the most elegant hockey palace in the world, the Ralph Englestad arena, affectionately known as “The Ralph”. Built with private funds donated by prominent real estate investor and casino owner, Ralph Englestad, “The Ralph” is a thing to behold. With leather seats, luxury boxes and seating for over 11,500, the home of fighting Sioux hockey is a place that many NHL teams would be proud to call home. Thanks to Dave Vasicheck (my de-facto son-in-law and ND native) over the past couple of years I’ve attended the WCHA championship game at the Xcel arena in St. Paul. Last night was typical, as the Sioux beat the Denver University Pioneers 4-0 on their way to the frozen four. This is good hockey and there are always a few future NHL stars on the ice. As an avid Chicago Blackhawks fan and season ticket holder, I’ve been thrilled often by the play of former NDU star Jonathan Toews, captain of the Blackhawks. 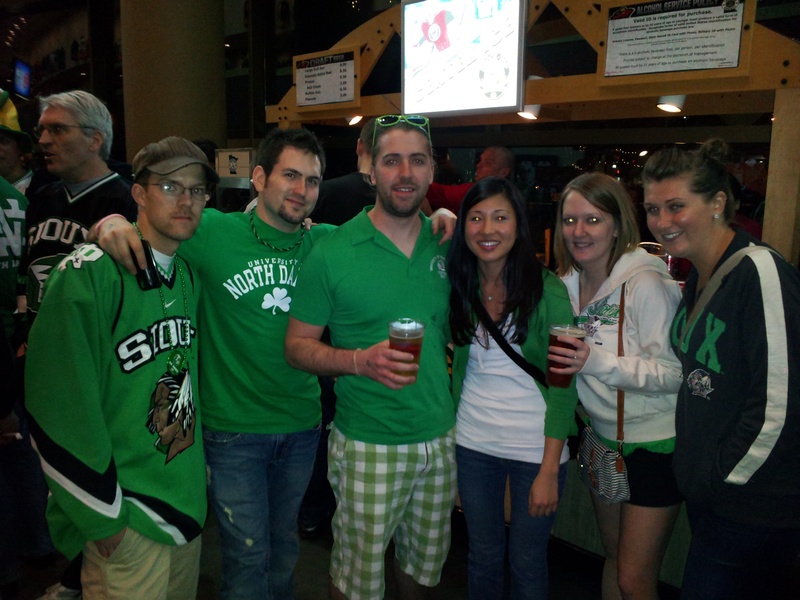 Opposing fans often become overwhelmed by the loyalty, fanaticism, and tenacity of Sioux hockey fans. They’ll make the trip to St. Paul and fill up the Xcel energy center like it was a tiny bar in Glen Ullen. These are decent folks who care more about their college hockey team than nearly every other fan base in the sport. They wear the “fighting Sioux” logo, in opposition to the whimpering of the politically correct. The majority of Sioux Indians in North Dakota also support the legendary “fighting Sioux” symbol proudly worn by the team and its fans. Fighting Sioux hockey isn’t just another pretty team; it’s the real deal in a real state. Later today I’m going on line to look at some “fighting Sioux” hockey jerseys. After all, last night I formally added my name to the list of rambunctious, excited people that call themselves fans of NDU hockey!